The gripping Martha Marcy May Marlene is one of those films that makes you want to rush out and urge everyone in sight to see it as soon as possible. I felt the same way about Winter’s Bone in 2010, and MMMM ticks some of the same boxes: an American indie centred around an incredible performance by a young actress I’d never previously heard of, with a great supporting turn by John Hawkes. But the film is very much its own beast. 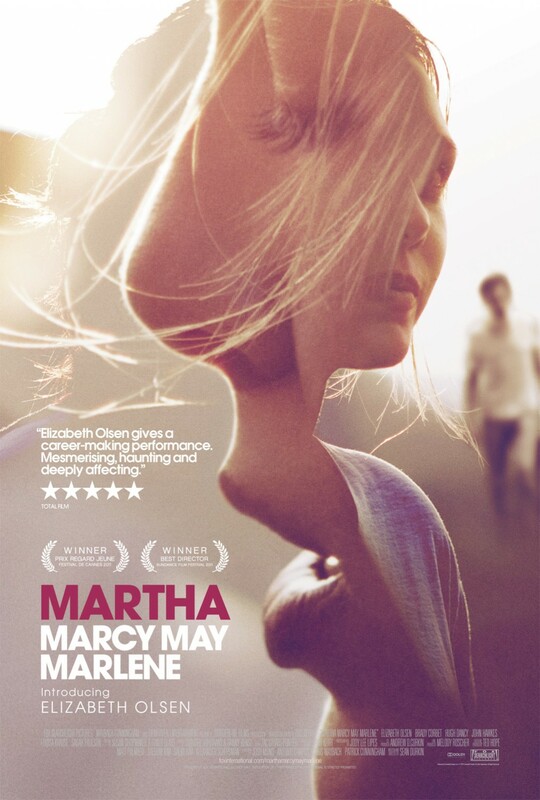 The film opens with Martha – aka Marcy May (Elizabeth Olsen) – slipping away from a small country farm where, we learn, she has been living for a couple of years. Apparently terrified, she calls her sister Lucy (Sarah Paulson) to collect her. Once back at the home Lucy shares with her husband (Hugh Dancy), Martha tries to settle in; refusing to discuss where she’s been or what has happened to her, it’s only gradually that they, and we, register how deeply traumatised she actually is. This truth is revealed in part through a series of flashbacks to Martha’s time with the cult, which is presided over by the charismatic but evil Patrick (Hawkes). The situation so far is not unfamiliar if you’ve seen other films about Manson-inspired cult leaders (sure enough, the trailer reorders them into chronological order, making the film appear much more of a conventional thriller than it actually is). Plenty of horror films have taken the same basic premise, though the horror in MMMM is psychological rather than the more graphic horrors of, say, Kevin Smith’s Red State. Writer/director Sean Durkin constructs his film so that as the flashbacks become increasingly disturbing to watch, so Martha’s behaviour becomes more and more unpredictable. Starting out as merely odd – she sleeps curled on the edge of her bed, goes swimming naked and is surprised that anyone might be shocked – by the end she has become completely paranoid, barely able to tell what is real and what isn’t. It’s a shame that Hugh Dancy’s character is a rather two dimensional yuppie, as it weakens some sections of the film. Martha critiques his materialistic lifestyle, pointing out that there are other ways to live. If the intention is to suggest that modern capitalistic enslaves people just as much as crazy cult leaders in the middle of nowhere, it doesn’t quite come off. But it’s a minor problem. Olsen is superb in the lead role, and deserves award recognition. As her mental state deteriorates, we are ultimately sucked entirely into her fractured world view. The way the film ends will not be liked by all. I’ve heard it compared to the ending of the recent Take Shelter, which I felt was entirely different, and more accurately to John Sayles’ Limbo. All I can say is that it worked for me, and the final scenes had my stomach in knots. This riveting film is a triumph for both Durkin and Olsen. This entry was posted in Reviews and tagged Elizabeth Olsen, John Hawkes, Martha Marcy May Marlene, Sean Durkin on January 28, 2012 by Gareth Negus.